In this brilliant exploration of our cosmic environment, the renowned particle physicist and New York Times bestselling author of Warped Passages and Knocking on Heaven's Door uses her research into dark matter to illuminate the startling connections between the furthest reaches of space and life here on Earth. Working through the background and consequences of this proposal, Randall shares with us the latest findings -- established and speculative -- regarding the nature and role of dark matter and the origin of the Universe, our galaxy, our Solar System, and life, along with the process by which scientists explore new concepts. 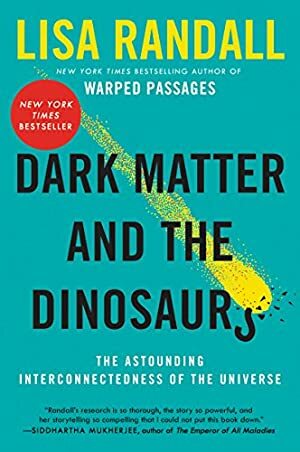 In Dark Matter and the Dinosaurs, Randall tells a breathtaking story that weaves together the cosmos' history and our own, illuminating the deep relationships that are critical to our world and the astonishing beauty inherent in the most familiar things. Log In to track Lisa Randall on eReaderIQ. to be notified each time the price drops on any book by Lisa Randall. to stop tracking Lisa Randall. We started tracking this book on March 22, 2017. The price of this book has changed 13 times in the past 761 days. This lowest price this book has been offered at in the past six months is $6.49. The lowest price to date was $1.99 last reached on July 20, 2018.